Selbaie Property — LaSalle Exploration Corp.
Selbaie hosts IP anomalies along prospective structures - prime drill targets. LaSalle's Selbaie Property was acquired by map designation to cover the southeastern contact of the Brouillan Batholith. The property is composed of 14 claims, 100% held by LaSalle in the Northern Abitibi Belt located 12 kilometres east of the old Selbaie Mine. The Selbaie Cu-Zn-Au-Ag deposit is located within the western pressure shadow of and along the southwest flank of the Brouillan intrusive, a central intrusion/resurgent dome complex. 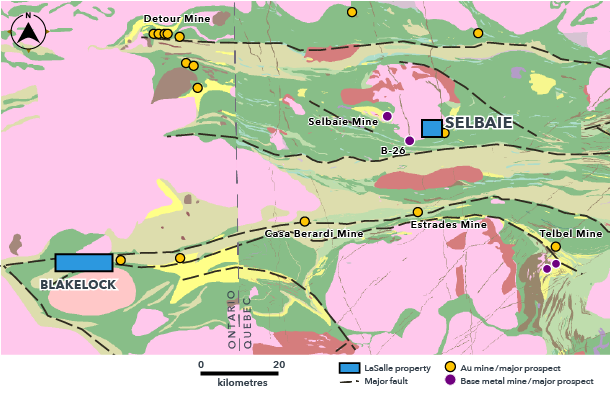 The Selbaie mine was operated by Billiton until 2004 and had a mining resource of 57 Mt composed of VMS type containing approximately 1 Moz Au (not a 43-101 compliant disclosure) considered to represent a sub-type volcanic associated sulphide deposit and epithermal vein and breccia-type mineralization associated with strong potassic alteration (porphyry Cu style). It has been postulated that the deposit was formed within a large caldera structure over the Brouillan Batholith. Regional work has identified that the Brouillan Batholith is in fact a complex of intrusive events including mafic gabbroic rock to granodiorite/tonalite flanked by volcanic sequences. Past exploration for Selbaie-type deposits have all focused on the Brouillan volcanic sequence south of the Batholith. 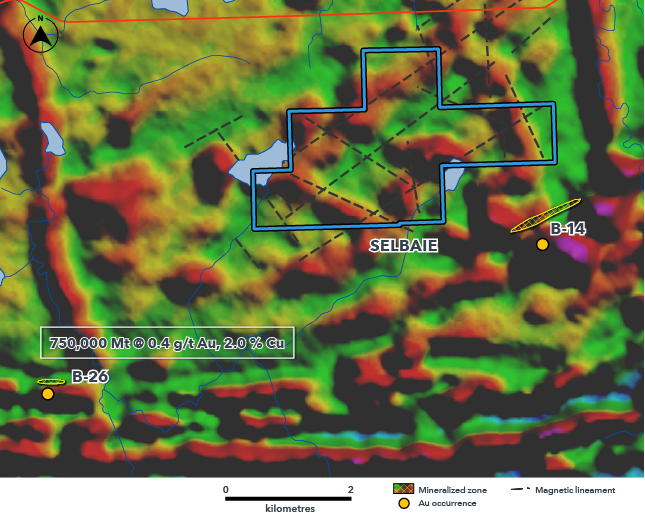 Compilation work by LaSalle has revealed values of up to 0.2% Cu within a felsic volcanic sequence intruded by a syenite. Prospecting in this target area is hampered by areas of extensive overburden cover however two significant outcrops were uncovered and shown here below. A strongly altered granodiorite with strong quartz veining and a breccia body hosting iron carbonate fragments found during a prospecting effort support the thesis of gold mineralization potential near the sheared intrusive contact oriented northeast. In March 2019 Wallbridge reinforced these values while reporting a drill intersection of 2.55 g/t gold over 20 metres. Quartz veins in an altered granodiorite. Selbaie Property, Northern Abitibi Belt.